San Diego is a great place to visit and we are happy to host family and friends when they head out our way. Being Frugal shared how to be a good house guest when visiting relatives which got me thinking about what does it take to be a good host. For now I don’t have a guest room because we turned the extra bedroom into an office. We furnished it with a Ikea futon which serves as seating and a decent guest bed. Even if you don’t have a separate bedroom guests need space to have privacy and relax occasionally. If you travel often or get free products in the mail you probably have a lot of sample-sized beauty products. 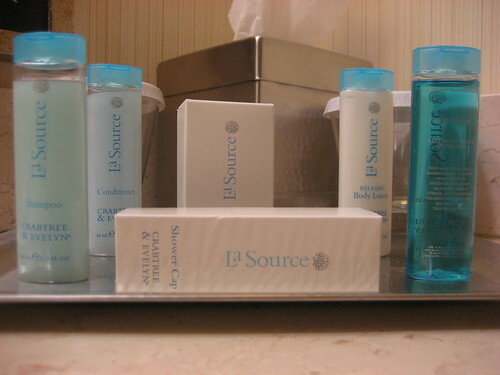 I put these in a basket placed in the bathroom used by the guests for their convenience. If they forgot to bring shampoo or toothpaste it’s there and they don’t have to ask. Remember to put out bath linens and make sure the bathroom is stocked with necessities. Find out if your guests have medical conditions or food allergies that impact the menu. My mother is not supposed to eat meat other than poultry so we have dishes or options for chicken and turkey at all meals. I also try to pick up my guests’ favorite soft drink and snacks to make them feel at home. Our area has lots for visitors to see and do. Fortunately no one expects us to go to the zoo or Legoland with them. Instead I give coupons or buy resident tickets to save them money. A group trip to the park or beach is a good way to see local attractions without much cost. Making your family and friends feel welcome is easy and well worth the effort. What else do you do to prepare for house guests? That’s a good list you have. My mother happens to be visiting me at this time. We usually only have family members as houseguests so I’m not too worried about asking them to share shampoo, body wash, and toothpaste with the kids. I do provide towels but that doesn’t cost extra. We have only 3 bedrooms so while we have a guest, my boys have to share a room (one sleeps on a trundle). I wouldn’t worry about asking houseguests to share toiletries either. I just make the basket because it’s fun and makes the guests feel special. Hopefully your boys like to share when guests come. I love having guests, and I’ve learnt a lot about how to look after them from some great experiences when staying with friends and family. The travel-size toilettries is a good idea 🙂 If I’m feeling swish I sometimes do chocolates-on-pillows, which I remember from hotels in the past… but I think the most important thing is just to make sure that your guests feel welcomed. Rachel, chocolates on the pillow is a great idea! I’ll have to do that next time. Of course my mom has to watch sugar intake for medical reasons but maybe a flower? Being in Chicago, an added way I prepare for visitors is to make sure they are prepared for the elements! Also, I want to make sure they know the right time of year to visit. You have great, relatively consistent weather where you are in San Diego; over here, the time of year you visit can make a tremendous difference in your visit. Mid-May to Mid-October provides great weather, for the most part, in Chicago. The rest of the year…not so much! It could be tolerable or horrendous in the winter and early spring. So, for visitiors from warmer climates, I try to plan activities that keep this in mind, buy low-cost mittens or hats for kids visiting from warmer climates, and things of the like. Squirrelers, great idea. I just have to make sure people bring sunscreen, LOL. Seriously weather accessories is a wonderful additon to my list of guest preparations whether it be sunscreen, hats, mittens or umbrellas. Thanks for stopping by today! I seriously need some me time! These are great ideas! My home is usually where most guests lay their head when they come into my town. I guess they think staying in a hotel defeats the purpose of their visit. I can see that point! I’d rather stay with family/ friends than in a hotel. I love showing my family around and taking them to any current event my city has to offer. They usually leave talking about how much fun they had and that North Carolina is beautiful! My guest bathroom is stocked with all the necessities. I love the idea of getting personal sized toiletries for guests and putting them in a basket. Snagging Idea… Thanks! I’m so busy making sure the house is clean and in order that I don’t even look at the menu until the guests arrive. I usually make a list and go shopping. I can understand needing to know if there are any food constraints. I have food allergies and most often I’ll inquire how something was made and with what ingredients. I’ve ordered out a few times being the guest! I would definitely want to avoid my guests having to order out! Yes, the housecleaning is task on my list but I didn’t want to admit its not something I do all the time….